‘Tis the season to give! Share the gift of Amare this holiday season with your loved ones (or even yourself!). Check out our exclusive, limited-time Holiday Gift Sets below (only available while supplies last!). Color your stress away. This special set includes our best-selling full-size Mood+ and therapeutic Adult Coloring Book Set (coloring pencils included!) — perfect on-the-go! Sweet dreams. Set includes full-size Sleep+ and lightweight, Amare-branded Sleep Eye Mask for all those zzz’s you’ll need during the holidays. Tackle the holiday season with ease! This exclusive set includes full-size Relief+ and an Amare-branded Wonder Beads Heart for a boost of soothing comfort. Can’t pick just one? Grab all three sets in our ultimate gift set! Featuring all three products: Mood+, Sleep+ and Relief+ — exclusive gifts included! 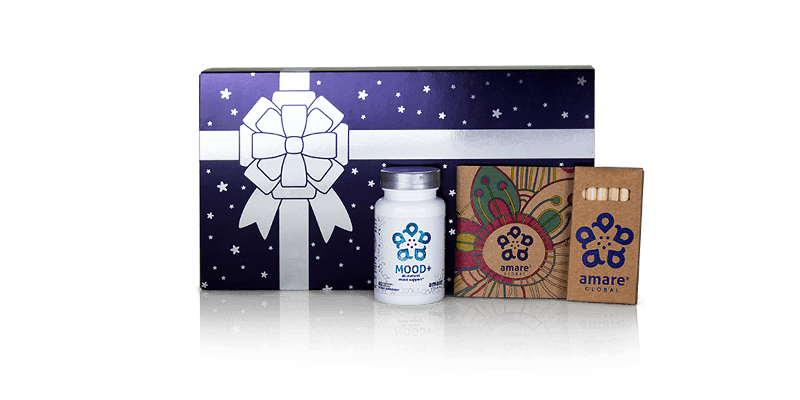 Remember, there is only a limited supply of our Holiday Gift Sets, so get yours today before they sell out!